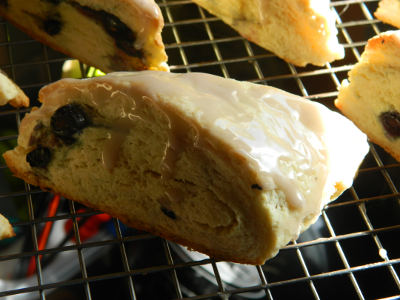 I have a new Saturday morning tradition: baking scones. Okay, so maybe doing something just two weeks in a row doesn’t quite qualify as “tradition.” But, you’ve got to start somewhere, and two weeks in a row is actually pretty good for me. Let me add that I’m no baker. I love to cook, and I’ll cook the hell out of a steak or a casserole… but I’ve always burned the cookies and ruined the pie, so to speak. Thus, it was with great hesitation that I tried my hand at scones. Fortunately, the inter-webs are a wonderful place. 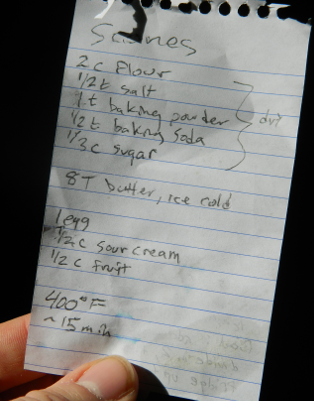 And although I very rarely use recipes in my cooking, I figured I should have a reference point from which to diverge in my scone adventures. I went web searching, and found three promising sources: Alton Brown, Allrecipes, and America’s Test Kitchen. 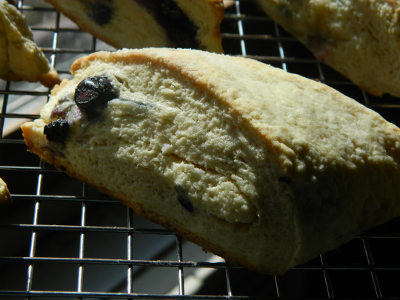 I stole their scone recipes and merged them into something I though would work for me. I had also recently purchased some pretty sweet stainless steel mixing bowls, and learned to make a simple sugar glaze. If all this information and equipment can’t help me make a decent fracking scone, then nothing would! I added all the dry ingredients to the bowl, and whisked them together. Then, I removed the butter from the freezer (yes, you should freeze the butter!) 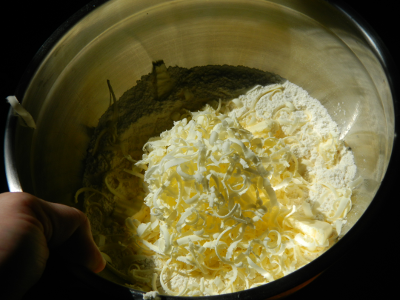 and grated it into the mixture. I just used a regular, large tooth cheese grater. 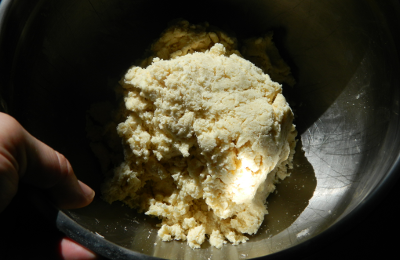 Then, a few chops with the pastry blender later, and the mixture should have a nice “crumb” to it… meaning, it looks a little like oatmeal, has tiny and small chunks of butter, but is otherwise dry. 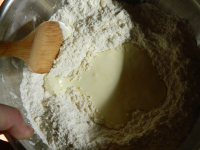 Make a hollow in the dry ingredients. Then, whisk the sour cream and egg together. Add it into the hollow. 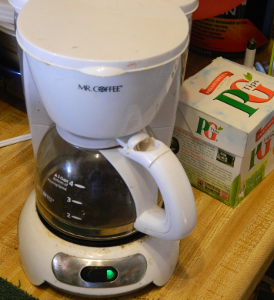 At this point, I found the best way to combine everything was to begin stirring from the center, and slowly work outward. In math-speak, I let the radius of my circular stirring motion increase slowly with time. This keeps up a continual “feeding dry into wet” system that seems to work well. Now, you sort of have to use some observational power. 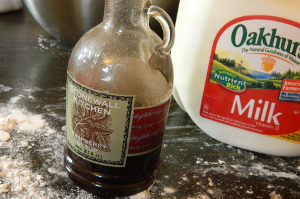 The dough was not holding together after a good mix, so I added one Tablespoon of milk. Stirred that up. Still not quite there. Added one more Tablespoon of milk. Stirred. Ah, there it went! The dough should NOT be anywhere near wet. When you reach in, you can grab a handful, squeeze, and it should come together, but not really stick to you. 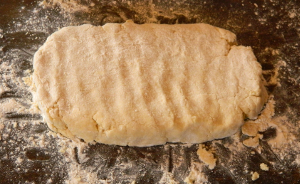 Lay the dough out onto a floured surface, and using nothing but your fingers (I use the backs of my fingers, just because I like to), flatten it out into a rough rectangle. Flip it over and complete. Dust with flour as you need to. 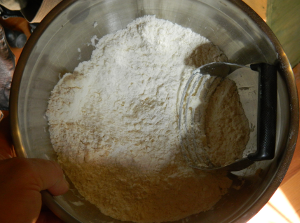 If anything sticks to the table, just toss on a little flour, rub it into a clump, and add it back to the dough. Once you’ve gotten a nice shape to it (as above), you get to do “the trick” to light, flaky scones… Remember when we used to communicate with each other by writing letters? You’d have to fold your letter so that it fit in this thing called an envelope, and place something called a stamp onto it. You’d then leave the letter at the end of your driveway and some stranger would come along, pick it up, and take it to your friend for you! It was pretty slick. 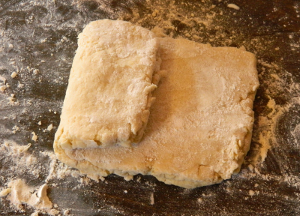 Anyway, the point is that you want to fold up your dough like a letter, using a tri-fold, then flatten it again with your fingers into another rectangle. Do this three times. Now we can add the fruit. In this case, I used some frozen blueberries. I had nothing fresh on hand (it is early April in Maine… the only fresh ingredient available to me is mud). 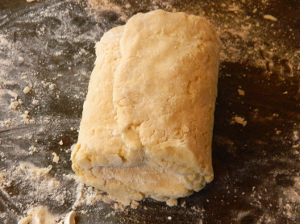 Press out the dough a little larger than your earlier rectangle, being careful not to make it stick to the surface. Flip it at least once and dust with flour. 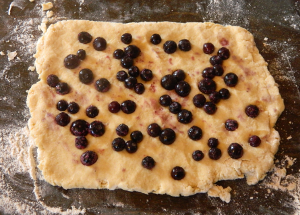 Then, just press the berries into the dough. Finally, tri-fold what you have, and press it with your fingers out into a nice, flat, log shape. Cut into four even pieces, and diagonally cut each of those pieces in half to form little triangles. Why triangles? Because people like to eat pointy foods! We’re then ready to put the scones on a buttered baking sheet and pop them into a 400F oven for 15 minutes. While the scones are baking, I make the glaze. 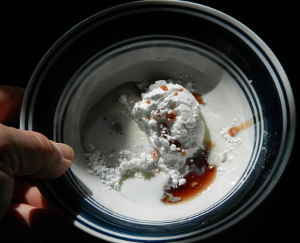 For this glaze, I used 2 Tablespoons of confectioners sugar, 1 teaspoon of raspberry syrup, and 2 teaspoons of milk. Just whisk it all around with a fork or very small whisk. You want it to be the consistency of paste. If it’s too runny, add more sugar. If it’s too dry, add more milk (in very, very small amounts). You could use any kind of flavoring… I love this raspberry syrup, though! Other options would be regular maple syrup, vanilla, some orange or lemon zest… whatever you think will pair well with the fruit.